— Oct. 4, 1957: First artificial satellite, Sputnik I, is launched by Soviet Union. — April 12, 1961: Soviet cosmonaut Yuri Gagarin completes the first manned space flight, orbiting the Earth in 108 minutes. — May 5, 1961: U.S. launches first American astronaut, Alan Shepard Jr., into space, on a 15-minute, 22-second suborbital flight. — May 25, 1961: President Kennedy declares the American space objective to put a man on the moon and return him safely by the end of the decade. —Feb. 20, 1962: John Glenn becomes first American to orbit Earth, completing three orbits. — June 16-19, 1963: Cosmonaut Valentina Tereshkova, the first woman in space, completes 48 orbits. — March 18, 1965: Cosmonaut Aleksei Leonov takes man's first space walk. — Jan. 27, 1967: Astronauts Gus Grissom, Edward White and Roger Chaffee die when a fire sweeps the Apollo I command module during a ground test at Kennedy Space Center. — April 24, 1967: Cosmonaut Vladimir Komarov is killed when his Soyuz I spacecraft crashes on return to Earth. — Dec. 21, 1968: First manned spacecraft to orbit moon, Apollo 8, comes within 70 miles of lunar surface. — July 20, 1969: Man walks on the moon. 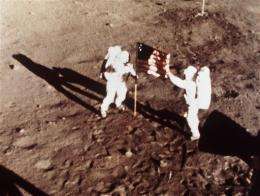 Neil Armstrong and Edwin "Buzz" Aldrin of Apollo XI spend 21 1/2 hours on the moon, 2 1/2 of those outside the capsule. — June 29, 1971 - Three cosmonauts, Georgy Dobrovolsky, Vladislav Volkov and Viktor Patsayev, die during re-entry of their Soyuz 11 spacecraft. A government commission disclosed that the three died 30 minutes before landing because a faulty valve depressurized the spacecraft. — Dec. 7-19, 1972: Apollo 17 mission that includes the longest and last stay of man on the moon—74 hours, 59 minutes—by astronauts Eugene Cernan and Harrison Schmitt. — May 14, 1973: Skylab I, first U.S. orbiting laboratory, launched. — July 17-19, 1975: U.S. astronauts and Soviet cosmonauts participate in Apollo-Soyuz Test Project, docking together in space for two days. — April 12, 1981: Shuttle Columbia becomes first winged spaceship to orbit Earth and return to airport landing. — June 18, 1983: Sally Ride becomes first American woman in space. — Feb. 7, 1984: Astronaut Bruce McCandless performs man's first untethered spacewalk with a Manned Maneuvering Unit off the Challenger space shuttle. — Jan. 28, 1986: Challenger shuttle explodes 73 seconds after launch, killing its crew of seven. — Nov. 15, 1988 - Soviets launch their first space shuttle. The 3-hour, 20- minute flight of the shuttle Buran is unmanned. — Dec. 21, 1988 - Cosmonauts Vladimir Titov and Musa Manarov return to Earth from Soviet space station Mir after man's longest space flight - 365 days, 22 hours, 39 minutes. — March 14, 1995: Norman Thagard becomes first American to be launched on a Russian rocket. Two days later, he becomes first American to visit the Russian space station Mir. — June 29, 1995: Atlantis docks with Mir in first shuttle-station hookup. — Sept. 26, 1996: Shannon Lucid returns to Earth after 188-day Mir mission, a U.S. space endurance record and a world record for women. — Oct. 29, 1998: Glenn, now 77, returns to space aboard shuttle Discovery, becoming the oldest person ever to fly in space. — May 29, 1999: Discovery becomes first shuttle to dock with the international space station, a multinational, permanent, orbiting research laboratory. — Nov. 2, 2000: An American and Russian crew begins living aboard the international space station. — Feb. 1, 2003: Shuttle Columbia breaks apart over Texas, 16 minutes before it was supposed to land in Florida. — July 21, 2011—Final space shuttle mission ends when Atlantis arrives at Kennedy Space Center.